Based on the results of carbon source consumption in cell suspension culture of Panax quinquefolium L., 30 g L−1 sucrose was fed into a 5-L stirred tank bioreactor on day 16 of culture to enhance cell density and metabolite production. Using a fed-batch cultivation strategy, polysaccharide production was enhanced to 1.608 g L−1, which was 1.96-fold greater than with batch cultivation. The maximum saponin yield (7.828 mg L−1) was obtained on day 24 and was about 36% higher than the yields obtained using batch cultivation. 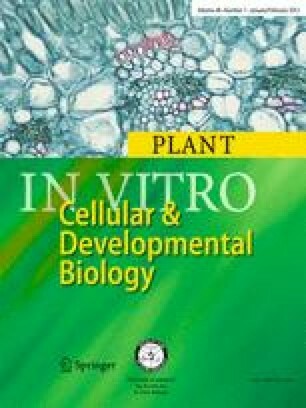 In a two-stage culture process, a combined treatment with sucrose, lactoalbumin hydrolysate, and methyl jasmonate caused a significant increase in total saponin yield (31.52 mg L−1) in cell cultures after 27 d. This value represents an increase of 4.03-fold compared with the total saponin yield in fed-batch cultivation. The two-stage culture mode provided the best method for the in vitro production of secondary metabolites from P. quinquefolium. This research was funded by Science and Technology Commission of Tianjin, China (09ZCKFSH01100).